Police departments and public safety buildings never have enough space. Take a look at how we’ve helped departments with their many law enforcement storage needs. Law enforcement agencies are experiencing unprecedented increases in arrests and convictions—and with that, an increase in evidence and inmate populations. Agencies around the county are feeling the pinch that comes from a lack of space more keenly than ever before. We want you to be able to take your space back—and we believe that smart storage is the key. It’s not just about storing evidence, weapons, gear, and uniforms—it’s about increasing the morale and preserving the safety of your officers and employees by giving them an organized space to work in. It’s preserving the chain of custody to avoid lost or misplaced evidence—and in a worst-case scenario, a public relations nightmare for your department. Better storage leads to better work for the community you serve. Take a look at how Systems & Space and our Spacesaver partners have provided law enforcement storage solutions for agencies across the county. Police officers, firemen, and other law enforcement personnel have demanding jobs, Enhancing their morale and boosting their moods will create a much more effective and efficient work environment—and one way to do that is to give them the space they need to do their jobs. 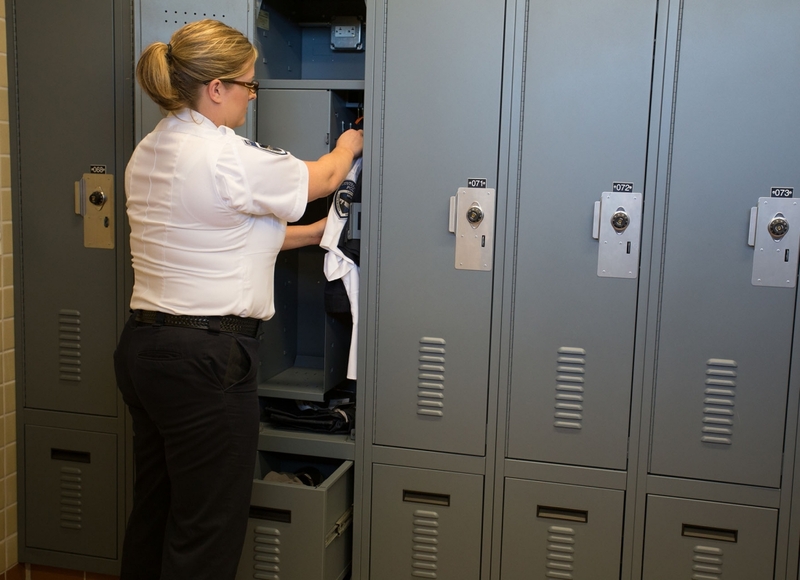 At the Brentwood Police Department, the department wanted to create a locker room space where each officer could configure their locker based on their own storage needs. Spacesaver’s FreeStyle Personal Storage Lockers offered them a chance to do exactly that, with locked sections for personal items, an array of hooks and shelves, and a bottom drawer that enabled upright storage of boots and a fitted tray for drying bulletproof vests. See how the Central Marin Police Authority used innovative storage solutions to bring two departments together under one roof with room to spare. Law enforcement facilities need to know where evidence is at all times— from the time they receive it to the date they are able to purge it. Pennsylvania’s Bensalem Police Department’s chain of custody was being compromised with an unorganized short-term evidence system, and it wasn’t helping their pursuit of state accreditation. A bank of pass-thru evidence lockers created a more seamless transition for their evidence storage, creating a best practice for evidence documentation and decreasing the risk of lost or misplaced items. Once evidence enters a property room, it’s being kept longer than ever before—due to the advances in DNA testing and the reversed convictions that testing often creates. Facing a severe lack of space in their property and evidence rooms, many police departments have shifted to using high-density mobile storage systems as a way to compact their current evidence inventory while creating additional space for future items. For law enforcement agencies in large metropolitan cities, off-site storage facilities with mobile shelving have become a necessity. This was the case for the Houston Police Department, who utilized mobile high-bay shelving systems to store over a million items. 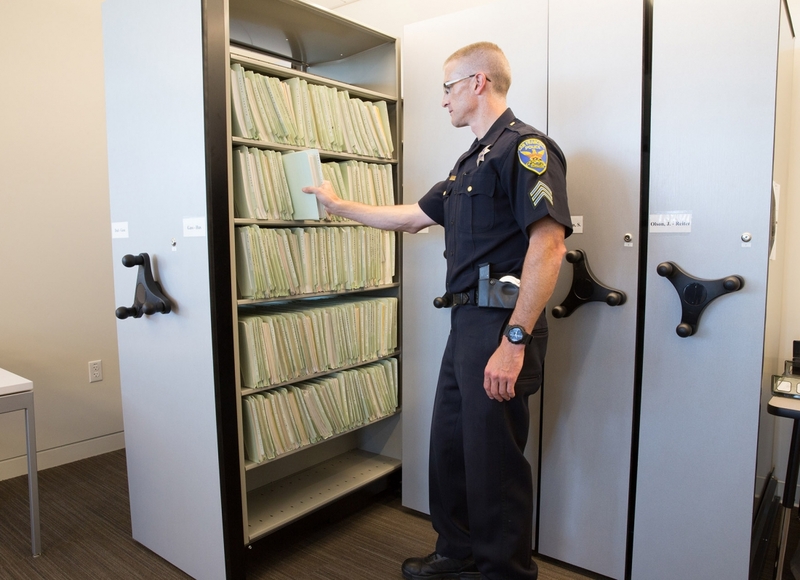 See how the San Francisco Police Department has made use of innovative public safety storage solutions to create a state of the art campus for their officers and employees. When it comes to weapons storage, two items are equally important: all gear should be stored in a way that ensures the security and safety of those weapons, and they should also be easily accessible in a central location in case of emergency. In addition to their evidence storage needs, Bensalem Police Department was also struggling to find weapons storage that would fit their diverse collection of weapons. With the help of sturdy weapons racks, the department was able to store a variety of guns, ammunition, and other gear all in a central location, regardless of type, size, or weight. We’ve designed law enforcement storage solutions for a variety of police departments and public safety buildings in the Northern California area. To find out more about how we can assist you with your project, download our Public Safety Storage Overview brochure.